Just another day at the home site. Concrete pump and guys at work. Forms for footings in place. Part of the A-Team, from left: Bob (concrete), Pete (panels), Doug (the general), Dave (excavation, septic), Rich (framer). Waiting for the concrete trucks. Bob directs the first of many concrete pours. At the end of the day we have footings. Much more concrete to come. View from garage toward breezeway (foreground dirt) with barn in background, driveway to right. With the weather less than ideal on the mountain for excavating, let along concrete pouring, it was time for a road trip, destination, Buffalo, New York. The business at hand was visiting a stainless steel fabricator we had in mind for our kitchen island countertop. In addition to accomplishing that goal, we ended up being rewarded with two serendipitous encounters. The route from Upper Valley, New Hampshire, to the New York State Thruway and Buffalo takes you across Vermont. Been there; done that, dozens of times, mostly via the southern route, past Bromley Ski Area. The northern route, using 7 and 4, past Killington and Rutland, we’d taken less often so decided on that one. We were in no hurry, we had a hotel room in Rome, New York, a little more than halfway to Buffalo, and just needed to find a place for dinner. Once we crossed into New York, we passed a number of stone yards. Being in the market for some stone for the fireplace and foundation facing, on a lark we stopped at Natural Adirondack Stone Company. 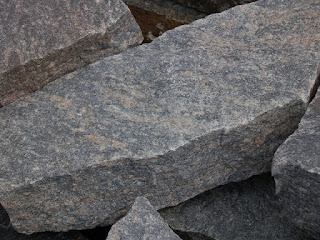 Adirondack Natural Stone Company Hawthorne granite. We struck gold and happened upon the original source of the stone were going to purchase from another supplier. Doug hit it off with the sales rep. and they talked stone for half an hour. They would happily sell and ship it to us without the middle agent. It doesn’t get better than that. Turns out that they procure the stone right there out of the Adirondack mountainside and cut it to size with a Steinex, a high-powered Italian stone splitter (called a guillotine). Now we are thinking up even more uses for the enduring and plentiful natural resource. We stayed in a Wingate hotel and were able to enjoy a Jacuzzi (membership has its rewards) before seeking dinner in Rome—some good wings and an exceptional (thin) mushroom pizza (washed down with Dogfish Head 8-hour ale from Delaware)—at an unassuming bar and grill called Vigneto’s. Our Buffalo meeting was a success, sitting down with Kevin and Ken from Specialty Stainless, a division of Eskay Metal Fabricating, and watching Frank operate the Trumph CNC machine (German-built, costing $250,000) that uses punches and dies to fabricate with a precision of 5/1000 of an inch. Our counter will be 304L 16-gauge stainless in an antique matt (not too shiny) finish, a marine edge, mounted onto 1 ½” MDF wood with an integrated 20x15x10 prep sink. Yowzah! We’ll be prepping some pretty fabulous meals there. While we were saying our goodbyes, Ken asked if we had ever seen the Martin House in Buffalo. We hadn’t. Truth is, we had never been to Buffalo, only through Buffalo a zillion times. Serendipity number 2: it is a Frank Lloyd Wright complex of houses currently undergoing major renovation. Who could pass on a FLW house tour? The Martin House, built between 1903 and 1905, is considered one the most important projects from his prairie period (although Buffalo is pretty far from any prairie), on par with Fallingwater and the Guggenheim. The complex consists of six buildings and includes the Martin house, a pergola, conservatory, carriage house with chauffer’s quarter, the Barton house for his sister and brother-in-law, and a gardener’s cottage. Darwin Martin house, 125 Jewett Parkway, Buffalo. into a garage and is now a gift shop. The house was commissioned by Darwin Martin, an executive of the Larkin Company, a soap manufacturer that branched out into mail order and became a rival to Sears Roebuck. Martin developed a ledger system for keeping track of their customer accounts and moved up the ranks in Larkin. When Martin asked his brother-in-law in Chicago if he could recommend an architect for the company’s headquarters, he suggested FLW. Martin signed him on and also commissioned his own house. When the Larkin Administration Building was completed in 1904, it accommodated a 1,800 corresponding secretaries, clerks, and executives. 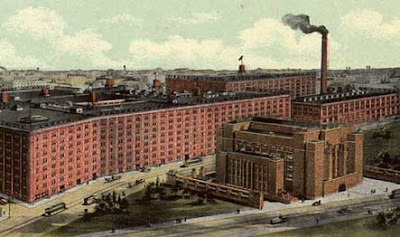 The red brick and steel structure was air conditioned and had built-in desk furniture. In the early 1940s, with the company in decline, the city foreclosed on the building for back taxes. The buyer of the property demolished it in 1950 despite protests from the design community around the country. Today a parking lot occupies the land. Driving around Buffalo today it’s hard to imagine its golden era as a vibrant industrial city. Let’s hope there are some renovations in its future, too. Peter Mitchell with a kayak paddle. We knew that moving to New Hampshire and building a timber frame home on a mountainside that we would be getting into wood in different ways. It would surround us, warm our house by the cord, and inspire us as we walked through the woodland on a trail system personally blazed. Then our path crossed with that of Peter Mitchell of Mitchell Paddles. He’s a guy who is really into wood (as is our timber framer Tom Page). Just the other day we had the pleasure getting a personal tour of his workshop. Paddle grips await more sanding. Peter says, tongue in cheek, wood dust and shavings are the principal products to come out of his family-owned business just down the street from us in Canaan, New Hampshire. Belying his modesty, Mitchell Paddles are world-class, a synthesis of form and function. Whether your sport is canoeing or kayaking, amateur or professional, Mitchell Paddles are used to propel watercraft throughout the world. Customers include the U.S. government and sporting goods distributors in Europe. What distinguishes a Mitchell paddle is the incredible amount of skilled hand finishing that goes into every item. Peter’s pride in craftsmanship shows in the details. Peter buys his wood from suppliers in the United States and builds a paddle from multiple wood planks. It starts with rough cuts that can then be pieced together to make the distinctive face of a Mitchell. Peter shows us some remnants of a blade block for a custom kayak paddle with its layers of western red cedar, basswood, walnut, ash, repeated in a symmetrical pattern. The way he cuts the blades guarantees that there will be bands of wood with identical grains on mirroring sides of the blade shaft. Two halves of a paddle blade. Why so many woods? Wood, basically a carbon molecule called lignin in various configurations, scientist husband Doug explains, offers the woodworker extremes: hard or soft, strong or flexible, heavy or light. Depending on the application, one wood is more desirable than another. Ash is strong and flexible. Maple, which is durable is good for adding a protective layer to the edges of paddles. Wenge (which he sourced from Africa and is dark enough to act as a replacement for ebony) is extremely hard (and hard to work with, dulling tools with its stubborn grain) and adds a dark contrast line. The power tools in the Mitchell workshop are beefy versions some of the usual types: A 60-year-old De Walt cross-cut radial arm saw, a Tannewitz table saw, band saw, spindle shaper. And then there are some proprietary tools made precisely for the job at hand: a glue press his father David made that employs an air hydraulic system to inflate fire hose segments that secure blade blocks during the 24-hour gluing process—as many as 24 blocks can be pressed in the numerous setups. Another press for attaching handles to blades uses irrigation hoses and hydraulics to hold the paddle in place. Peter also has processes for applying fiberglass to the blades, as well as carbon fiber. Custom jigs assure uniform contour cuts. A seriously heavy and sharp saw blade. Peter hadn’t always envisioned he would one day be running Mitchell Paddles. He had played in the shop as a kid as young as 8 and of course worked in it when he was 18 and over summers and between college breaks. After he earned his degree in computer science from St Lawrence University, he worked for 8 years as a programmer. When his father 10 years ago expressed a desire to retire, Peter seized the once-in-a lifetime opportunity and took over the helm. Soon he plans to meld his technical background and passion for wood working, bringing in a computer numeric-controlled router, or CNC, to do some of the more repetitious aspects of creating rough paddle forms. The fine tuning, however, will continue to be done by hand and by Peter. At the end of our visit, he takes a paddle off the varnish drying rack and runs his hands over the shaft and blade. He uses no exotic tool to measure the graduated thickness of the paddle or detect any imperfection. It’s all in his hands. Going high-tech with a CNC router will not alter the quality of the product, but it will give Peter a little more time to attend to the fine details that have always distinguished a Mitchell Paddle. The beautiful final product with the iconic logo.